In the mid-sixties, Karl Wolf was an Air Force Precision Electronics Photographic Repairman and was loaned to NASA's Lunar Orbiter Project at Langley Air Force Base in Virginia. The United States space program was in full swing and NASA was trying to beat the Russians in landing the first human on the Moon. The lunar orbiters were designed to eventually map the entire moon, photographically, in high- resolution detail in order to find safe landing sites for an eventual manned Apollo mission. 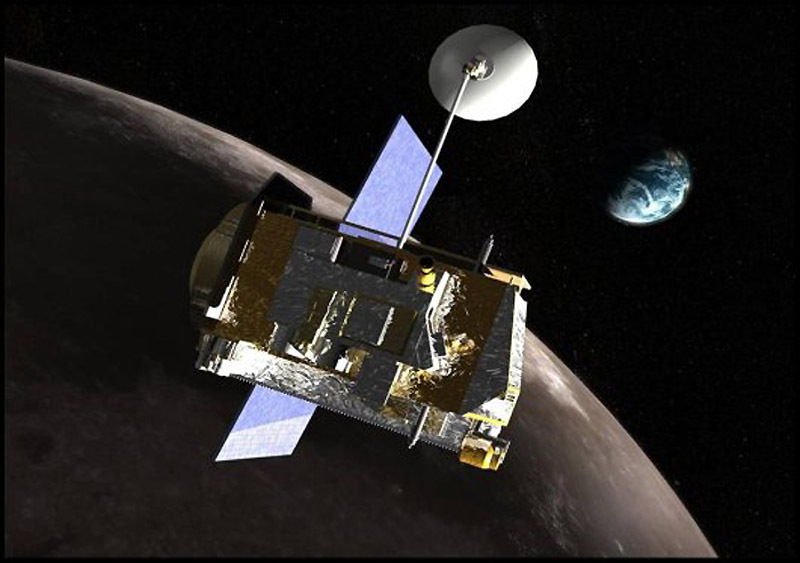 With these unmanned lunar orbiters, the never-visible-from-Earth back side of the moon would be mapped, as well. 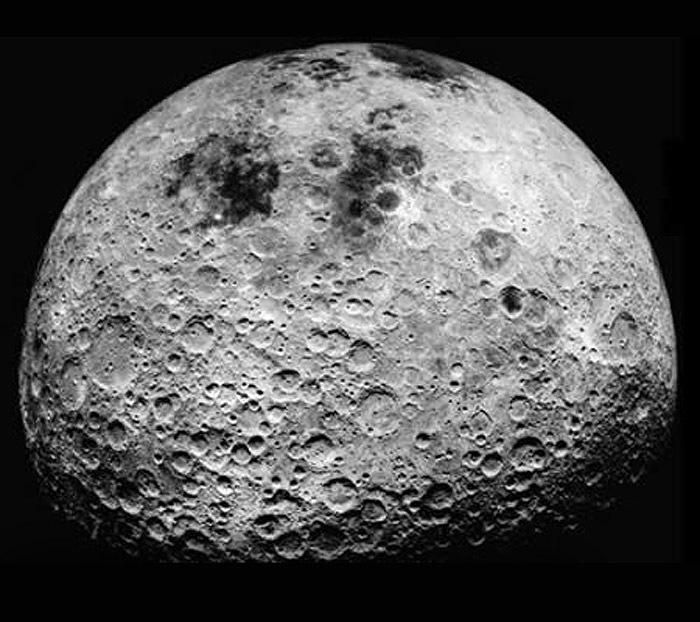 At that time, almost nothing was known about the far side of the moon. On one occasion, Sergeant Wolf was tasked with making repairs to equipment in a NASA lab at Langley where scientists and technicians were processing some of the first high-resolution images of the back side of the Moon. Due to technical problems, valuable new pictures streaming in from the orbiting space probe were bottlenecking causing considerable problems in the actual production of the photographs. Upon his arrival, Sergeant Wolf was puzzled to see scientists from all over the world in the facility. He wondered why they were there. After checking in, he found the location of the faulty equipment and proceeded to ask the one individual in the darkroom exactly how the equipment was working. After being there for a while and when no one else was in the room, the individual began telling Sergeant Wolf that they had discovered a "base" on the back side of the moon. According to testimony from Karl Wolf in the late 1990's, the above-mentioned individual was shown photographs revealing a large complex on the lunar surface that included numerous structures-- towers, spherical buildings and mushroom-shaped buildings-- from what he remembered. Realizing he was seeing something he wasn't supposed to be seeing, Sergeant Wolf immediately refused to look any further. Much to his surprise, nothing was ever reported in the news in the following days. And, Sergeant Wolf kept his mouth shut. Until then, Karl Wolf had known nothing about mysterious activity on that supposedly "dead" world we call the Moon or about government cover-ups. In actuality, the moon has never appeared to be a totally dead world. A quick check through history can reveal strange and mysterious events on the moon being observed by highly regarded astronomers throughout the several hundred year history of the telescope. The telescope is considered to have been invented and used as early as 1608 in The Netherlands in the cities of Middleburg in the province of Zeeland and in Alkmaar in the province of North Holland. 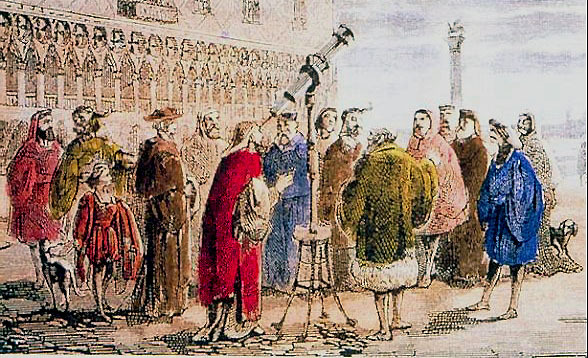 Galileo Galilei was among the first to use the instrument to study the heavens. Below is a listing of just a few of the hundreds and hundreds of credible observations throughout history of strange activity on our nearest neighbor: the Moon. 1668 November - New England - A star-like point of light seen on the moon by colonial minister Cotton Mather. 1783 - Astronomer Sir John Herschel (discoverer of the planet Uranus) reported bright lights during an eclipse - approximate brightness magnitude +4. 1787 August 18 - Astronomer Sir John Herschel reported seeing spots glowing like "burning charcoal" on the moon. 1821 November - Astronomer Sir John Herschel reported seeing strange lights "three times in succession". 1794 - Astronomer Royal, Reverend Nevil Maskelyne - reported to the Royal Society "lights in the dark portion of the moon". 1794 - A Mr. Wilkins reported to the Royal Society a dim star in the dark area of the moon. 1843 - German astronomer Johann Schroeter recorded a six-mile wide crater which he named Linne - estimated at 1,200 feet deep - while Schroeter made detailed maps of the moon, he noticed Crater Linne seemed to be disappearing - today, Linne crater is only a tiny bright spot with little depth surrounded by small pits of whitish deposits. 1847 - Claims made to the British Association of "luminous points" or lights on the moon witnessed during an eclipse. 1867 - The Astronomical Register reported that a Mr. Thomas Elger claimed he observed a light suddenly appearing on the moon and lasting for approximately two hours before disappearing. 1869 - Royal Astronomical Society of Great Britain conducted a 3-year study of mysterious lights occurring mostly in the Mare Crisium region of the moon - small lights seen in various arrangements, sometimes triangle and sometimes straight-line formations, moving and varying in intensity as if under intelligent control. Crater Plato was also the scene of some of the mysterious activity. After approximately 2,000 observations, the lights suddenly stopped appearing. 1869 August 7 - A Professor Swift of Mattoon, Illinois reported observing several objects in flight crossing the face of the moon during early phases of a lunar eclipse - confirmed by French astronomers, Hines and Zentmayer. 1874 - A great number of "black objects" crossing the face of the moon - reported by French observer, Monsieur Lamery. 1874 April 24 - Czechoslovakia - A Professor Schafarik reported to the Astronomical Registrar - XVIII, 206 - seeing an object that was "blinding white" slowly crossing the face of the moon and "remained visible afterwards". 1877 February 20 - Rash of sightings - Observatory near Paris, France - lights seen in Crater Eudoxus. 1877 March - Great Britain - A Mr. C. Barret witnessed a bright light in Crater Proclus and was "not a reflection from the sun". 1877 June 17 - a Professor Henry Harrison spotted a light on the moon while another astronomer reportedly saw a light in Crater Bessel. 1877 - Astronomer Dr. Klein reported a "luminous triangle" on the floor of Crater Plato- confirmed by other reports. 1899 - Luminous object spotted moving close to the surface but above the moon - sighted by Dr. Warren E. Day near Prescott, Arizona and G. Scott of Tonto, Arizona. 1944 August 12 - A "very bright round spot of light" in center of crater, Plato. 1950 March 30 - British Astronomer, H. P. Wilkins using 15-inch (diameter) telescope observed an oval-shaped "weird glow" in the Aristarchus-Herodotus region of the moon. 1953 July 29 - John O'Neill, science editor for the New York Herald Tribune, noticed what appeared to be a 12-mile long "bridge-like structure" that had not been noticed before during countless observations of that region of the Mare Crisium area (Sea of Crisis) - was attacked by skeptical colleagues until H.P. Wilkins, then considered number one expert on lunar topography, backed up O'Neill's claim - also later backed up by noted astronomer Patrick Moore. 1958 Russian astronomer Nikolai Kozyrev reported seeing a red "cloud" on or near central peak of Crater Alphonsus - "seemed to move and disappeared after an hour"- felt it could have been volcanic activity. 1963 October 30 - John Greenacre of the Lowell Observatory reported a glowing red light on the surface of the moon. The presence of strange activity on earth's moon has been documented for centuries by highly reliable members of the science community. The presence of unidentified flying objects around Earth has now been confirmed by a countless number of credible human observers. Strange craft and mysterious lights have been observed operating in the skies and oceans of Earth for quite some time using an advanced technology unknown to the human race. 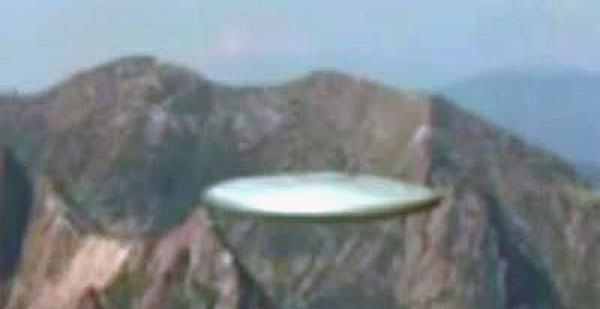 A large amount of covert interaction between these mysterious flying objects and the human race has been detected over the past several decades by many human beings as the human population on earth has dramatically increased. It would seem likely that the users of these craft-whatever types of beings they might be-would choose to have an established presence on earth's nearby moon in order to facilitate their stealthy agendas and operations on Earth and possibly other worlds within this solar system. Worldwide witness testimony generally agrees that several different races of humanoid-shaped beings are operating in the vicinity of earth. If this is true, then some or all of these races are most likely responsible for much of the strange activity observed on the moon over the past few hundred years. Likewise, intentional covering up by modern-day governments of the existence of these beings and their technology has now been revealed by highly credentialed individuals who have gone public and the discovery of authentic, secret government documents. The astronomer who discovered the planet, Pluto, had encountered UFOs. Astronauts and cosmonauts, pilots and air controllers, astronomers and other scientists as well as various members of the military have seen them. All one has to do to become convinced of a secret, stealthy, extraterrestrial presence and a government cover-up is to do enough research into the matter. One need not become a member of the "black helicopter crowd" to draw a rational conclusion. The sheer weight of evidence is overwhelming. Most of today's claims by investigators regarding anomalies on the moon rely heavily on photographs of limited resolution, unfortunately, that generally appear too fuzzy and blurry to even be recognized by the average educated layperson of today. The relatively low quality of the photos generally leave a lot open for interpretation. Most people do not find them convincing-even though some of them may very well be true anomalies. But, if the images found on the Google Earth website turn out to be real, then readers of Filers Files and the Caviness Report might very well be witnessing the beginnings of a new era of discovery. Hopefully, time will tell.